All of these apps/services below are either new-to-me, new in general, or up and coming and looking like they’re about to change up the game here… And believe me, I’m getting a greaaaaat handle on what’s going on in our blogging community as I’ve started scanning EVERY SINGLE BLOG POST our industry puts out EVERY SINGLE DAY! Roughly 200-250/day. This one’s my #1 favorite on the list because a) I could have used it a TON back in my employment years!! and b) Hardly anyone is doing this right now – but it affects millions and millions of people. Ever wondered what the hell you’re doing with your 401(k) or 403(b)/401(a)/457 accounts? Then this is the company for you. For $10/mo Blooom will not only make sure you’re invested into the right – lower cost – funds for your situation, but also physically *manage it all* for you so you literally don’t have to do a thing anymore (though of course it’s always good to know what’s going on and stay in control). You sign up once, get your free analysis of how your account is looking currently, and then either go away and continue managing it all yourself (accepting their recommendations or not) – OR – continue forward and let them do all the monitoring and heavy lifting for you from now on. And the best part is you get direct access to registered financial advisors who can’t put you in any random or outside funds or upsell you on anything because there’s nothing to upsell you on! You’re limited to the funds that your employer has hand-picked for you to choose from, for better or for worse, so it’s just a matter of optimizing them in the best way for you. If you’re already comfortable managing your 401(k) and don’t need any help, then Blooom isn’t for you. If you prefer to have someone else do it for you while keeping you in the loop, then I’d def. check them out. #2. 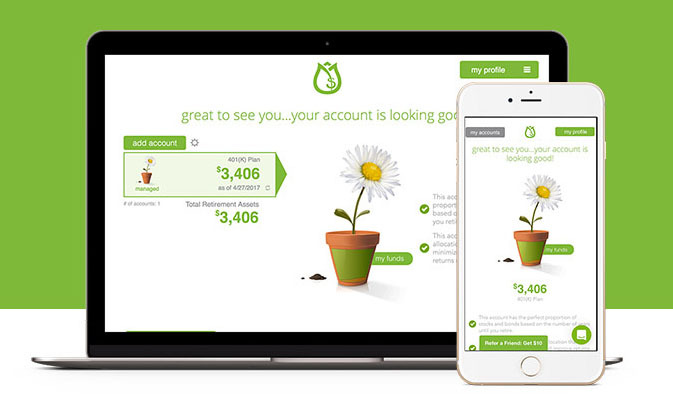 Chime – a simple online bank w/ built-in app features! This is one of the first banks I’d check out if I wasn’t such a fanboy of USAA. Similar to Simple Bank who we’ve featured here before, Chime gets how ridiculous Big Banks treat their customers and wants to make the banking process as easy and helpful as possible. Without fees, without hidden costs, and definitely without headache. What separates them from the other online banks though is their understanding of how much we LOVE our apps and features coming out left and right. Their vision is to have everything in one centrally located and connected place where you don’t need a bank plus 15 other apps to log into to get $hit done. You just have one – Chime (in their perfect world :)) – and you’re good. 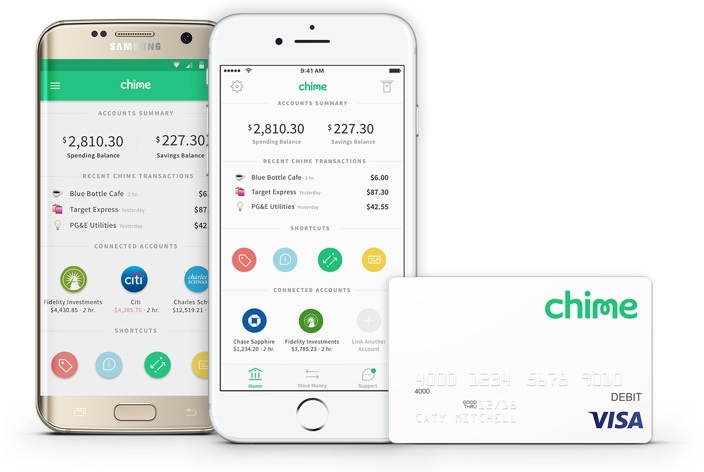 Save When You Spend – Similar to Acorns and other “round up” applications, Chime will help you save more by rounding up all your transactions to the nearest dollar every time you buy something. They’ll then automatically transfer the difference right into savings for you. Save When You Get Paid – You know how everyone tells you to “pay yourself first?” Well, this does exactly that. Activate this feature once, and then chime will automatically transfer 10% of every paycheck in the future right into your savings account before you even have a chance to spend it. Nice and simple (and smart). Early Direct Deposit – This one I’ve never heard of before (? ), but basically if you’re a member of Chime and your employer directly deposits your paychecks every payroll, you can sometimes see your money show up in your Chime account up to two days faster than normal. Again, never seen this before as I’ve been out of the 9-5 world for a while, but sounds kinda cool? Pay Friends – Lastly, Chime makes it super easy to xfer money between friends with a click of some buttons. While not exactly an *app* (Trim works through text messaging and Facebook Messenger), they act in pretty much the same way. And particularly, to better help you save money. In total you can nab $40.00 of cash back, again – only through your Visa card. #3. Trim Bill Negotiator – Sign up through either FB Messenger or text message, then connect your Comcast bill (update: and now any other cable/internet bill as Trim works with them all now!) and credit card you use to pay it with, and Trim will start negotiating it down on your behalf. If they succeed in saving you money, they take 25% of the savings for the first month only, and then you get to keep all the rest, and if they fail they don’t charge a thing. They say the average savings is about $30.00 every month – PRETTY COOL!!! Either way, here’s what they’re about below. The gifting option is my favorite! Much better to receive a gift of stock than another random tschotske or toy right?? Especially for kids? And those are my 4 latest favorites in the fintech world! brightpeak financial (FREE) — A division of Thrivent Federal Credit Union that rewards you for saving money into their “emergency savings account” (such a perfect name for an account, right?) Stash $50/mo into it for two years, and brightpeak will drop an additional $100 into it for you. Clarity Money (FREE) — A new app that claims they’ll be killing Mint.com (hah!). Hook up your accounts with them once, and then Clarity will analyze all the data and make suggestions on how to better optimize and save your money. But rather than just telling or showing you what to do, you actually have the ability to *take action* there directly in the app – the major difference between them and most other fintech apps. Self Lender — An alternative way to build credit back by saving. Their “credit builder account” offers a CD (certificate of deposit) that you *pay into* every month until the term is up, all the while recording your good payment history. It’s not free, but it could be a good option for anyone struggling hard w/ their credit right now. Qoins (FREE) — Similar to Acorns, this app rounds up all your daily transactions to the nearest dollar, and then applies the difference straight to your debts. I don’t know why this is the first app that’s offered this over the years (?? ), but of course I’m loving it! Anything that gets you to take action is good, even if it’s just a handful of dollars each month! Tip Yourself (FREE) — An app that allows you to transfer small dollar amounts from your checking account to a Tip Jar so you can reward yourself anytime, anywhere, whether it’s just $1.00 or a larger amount for something special! Been following these guys for over a year now and REALLY like what they’re doing. So easy and uncomplicated! Debitize (FREE) — If you’ve ever wanted to mix the benefits of both credit cards and debit cards (credit cards for the rewards, and debit so the bill doesn’t rack up! ), this is the tool for you. Debitize monitors your credit cards for new activity, and then automatically initiates a transfer out of your checking account into your Debitize account whenever you make a charge. When your credit card bill comes due, Debitize pays it for you – automatically and on time – with the funds from your Debitize account. So you still go about your business using credit cards as normal, but now without the fear of not having the $$$ in your account to pay for it at the end of the month. Honey (FREE) — One of the easiest ways to save while shopping online. Download the browser extension once, and then at check out click the Honey button and it’ll automatically scour the internet for coupons, and apply each one of them to your cart until it finds the one with the most savings. Sometimes it’s $1.00, and others $10.00 (depending on what you’re buying), and in all cases it literally only takes like 15 seconds. I’d say it finds me something about 50% of the time. Digit (Free for 100 days, then $2.99/mo) — My all-time favorite, despite them now charging $2.99/mo for it. Attach your bank accounts with them one, and then have their digital robots analyze your income/expenses and automatically transfer out a few dollars here and there that they know you won’t miss. They’re one of the pioneers in this automated savings game, and I believe in their vision so much that I actually joined their board of advisors! As of January of this year, BudgetsAreSexy readers who have signed up to them have saved $4,608,568.32 – pretty wild! 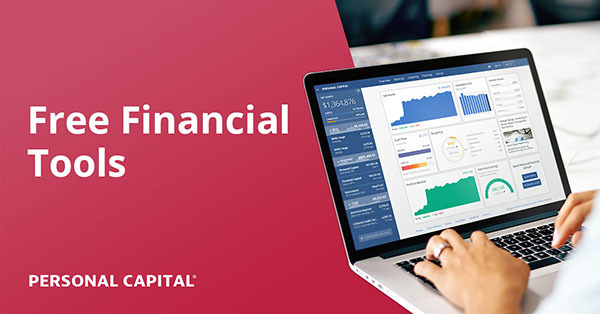 And then lastly, Personal Capital (FREE) — One of the PF world’s favorite fintech company which helps you visualize your entire financial picture all in one spot. Connect up your accounts one time, and then get immediate insight into your spending, income, investments, and our personal favorite – net worth. It’s a turbocharged Mint.com, only geared towards investing more so than budgeting. Needless to say, most of these apps/reviews above include affiliate links which means I’ll benefit financially if you end up signing up to any of them. As you know from over the years though, I only share companies I love and use myself, or those I think will greatly help others in different situations than I’m in (like the debt apps). In either case though, I never share anything just for the payout and do my best to provide value to y’all. Please let me know what you think whenever you sign up to any of them, or if you’d like me to check out other apps out there you find are powerful! Thanks for doing the up front work here for us. I’ve been enjoying Acorns for over a year now on your recommendation. So far my account is tipping $1k. From spare change. Cha-Ching! Agreed! While Acorns isn’t what I’d use for my primary investments, it’s great to see the value increase and not even notice the contributions coming out of my accounts! LOL! Love the Nokia Snake game at the end. You have no idea how much time I used to spend on that game when I was stuck waiting in line, etc. Bloom looks awesome. I had an idea to create something similar to this; I thought it was strange how little assistance there is to help young professionals pick out their 401k funds. But it sounds like they’ve gone a few steps further with the management and other perks. Nicely done. Right??? I only know of one other place that does something similar (Smart401k), but these guys take it further and will manually make the changes for you instead of just advice/analyzation – which is cool. So many of us are lazy with our 401(k)s and there are billions of dollars involved!! Hmmmm. Chime looks very tempting. If I didn’t already have Simple I’d definitely give it a go. But I’m also not sure if the features that Chime has are so unique, or if I need to look at Simple’s features more. I need to take a deeper look at Blooom, I have heard it talked about on a few podcasts and it sounds promising for the crowd that doesn’t want to deal with their 401k and might just select the standard option. I feel that you could get the same returns as they do without paying them :). Thanks for sharing these – may give Chime a look. I feel paying someone $10 to manage your 401K is adding on top of the fees you already have to pay, resulting in even less returns. 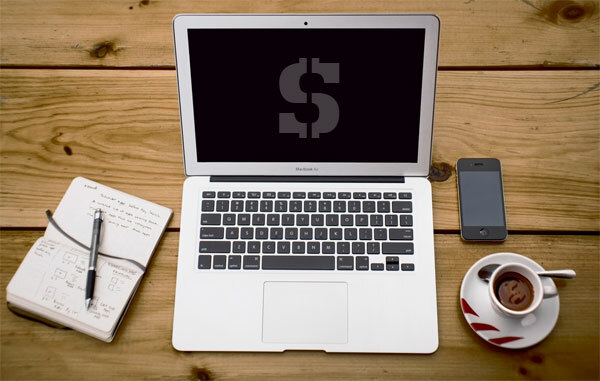 A 401K is the easiest investment fund to manage with the limits, so even taking the time to do some reading around the personal finance blogs could get you up to speed on what is best. I know my employer offers low cost index funds, bonds, retirement year, and foreign stock funds. With the very limited choices, it can be easy to figure out which to invest in. I get the convenience of it, but $10 a month = $120 a year. That + compound interest ends up being quite the loss over the long term. I agree with you Chris. I think those of us who are reading forums such as J$ do not need an app to review our allocations, especially at the cost. I personally like to know what I have and monitor it regularly. I guess it might be helpful for novices or those who have several accounts scattered over several employers and are looking for a way to manage them. But if you’re faced with limited choices and you’re young, a low cost stock index fund is the way to go. If you want to diversify, there’s plenty of material and it’s easily found to learn more. And it won’t cost you a penny. That’s a great point Paul – I was limited my perspective a bit from my own. Totally agree with your last point – thank you for sharing ! Yup – if you’re a nerd like us you’re good, but unfortunately most people are too lazy and/or too overwhelmed to do anything about it :( Even using them for a year and then cancelling once you understand it more would be pretty beneficial to them – at least it would make sure they’re not getting gouged w/ fees or worse – stuck in something like cash! Agreed with that last part! Better to pay to have someone help than do something that hurts you more :D.
I agree with this! Most people reading a blog about investing already have a good handle on their investing. But others, like me, are new and knowing what our options are keeps us educated so we can make the best choice for us right now. I love your perspective, thinking not only about the $120 a year, but also the compound interest that is being lost over the long term. I need to start thinking with that mindset as well! Yes! I just wanted to clarify when I say people interested in personal finance and reading blogs could easily pick investments, I really meant options in their 401k. It is much easier since its limited, and a very common topic for retirement since it is one of the most used accounts. Investing in individual stocks in your IRA or brokerage account is a different story – which is why most would recommend index funds for the majority of people who aren’t interested in learning how to value companies. It takes time and even experts are wrong at times :). Wow these are all great apps. Sometimes I feel like I’m stuck in the previous century because I’m so behind with technology. I love that brain power can churn out so many great products that help us save so much money! Lots I’ve never heard of! Thanks J. Money! I’ve been using Acorn for a few weeks now and am liking it a lot. I definitely want to check out Chime. I’ve heard of Simple but hadn’t heard the best of reviews. I love all the functionality you described. Thanks for sharing! Let me know if you end up giving them a shot! Hey J$! Thanks for sharing these! With all the new apps constantly popping up it’s hard to keep up with them all. trim looks especially cool! I’m lovin’ this list! I started using Acorns and I really love it. I like the idea of investing in micro amounts. It’s a great way to get experience with investing without regular big investments. I’m going to tell my bf’s two 20-something sons about Chime, it seems right up their alley. I signed up for Trim a couple weeks ago and so far have gotten $2 back from restaurant meals. My only gripe so far is that I have a USAA Visa and you can’t do the Amazon Savings thingie with it automatically, it requires manual filing….which they don’t have set up yet, so I’ve missed out on a bit of change. Ah well. I love Stockpile. Once Loyal3 shut down, I needed to find a platform that let me purchase partial shares. Stockpile is it. They have a huge amount of companies to choose from. Oh nice! I also hear Robinhood is good too which I totally forgot to add to this list – d’oh. 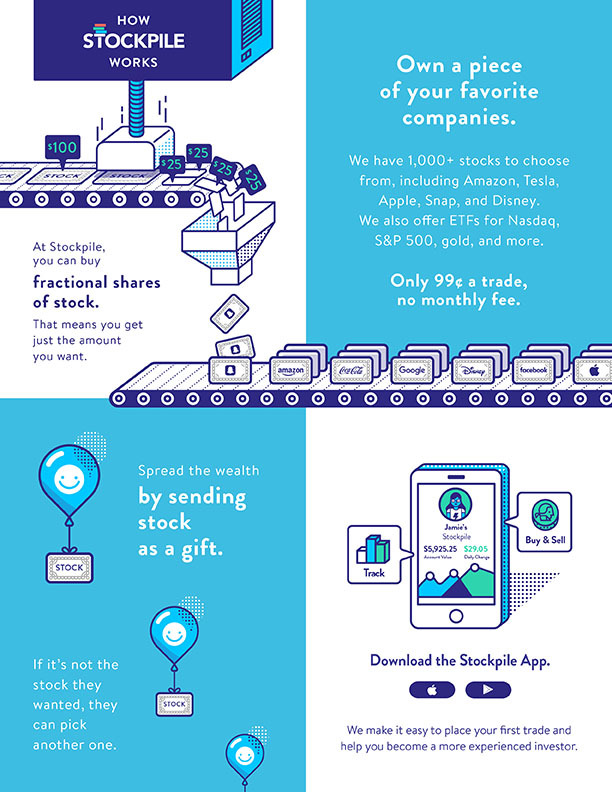 They give you *free* trades, but only US-based stocks and also entire stocks – unlike Stockpile where you can buy fractions of stocks. Stockpile sounds interesting and 99 cents a trade is a trade is pretty hard to beat. I think I’ll have to take a look at this one. Bloom is an intriguing concept. A great idea for the clueless who still would like to make smart choices, or those who have multiple 401Ks, to keep on top of changes. It would be worth it, just to have a professional eye analyze the fees and investment potential for you – at $10 a month a pretty good deal. However, I do agree with Chris who mentioned that $120 a year does add an extra fee – so ultimately, it always comes back to the old adage – your money, your responsibility – figure it out for yourself, because you owe it to yourself to manage your hard earned money well. I’d try it out for a year and then run with it on my own – plenty of time to learn what you need to know – after all 401Ks do not have that many options to choose from. Early Direct Deposit — I have this via my credit union for the last 3-5years and I love it. Before I used to get my paycheck every Wednesday but after my company got bought by another company, now I get it every Thursday. “I think” it works this way… When the company releases the money to the bank, it may take a day or two to release it to the bank but the bank already “knows” that it will be receiving the money, so the bank goes ahead and releases the money to the customer 1-2days ahead. Great list, I can’t believe we have come so far from the Nokia game in a just a few years. Fintech has exploded and it is very interesting to watch it all unfold. Chimes sounds amazing and a souped up version of Acorns. We don’t have Acorns in Canada but apparently there is a an app called “Mylo” for Canadians. Stockpile sounds like a great idea too. Basically no one has an excuse not to invest now! Oh nice! Wealthsimple is in Canada too :) Before they made it to the US even! I feel like so many bright people who used to go to Wall Street are now building startups in Silicon Valley. Right now, the next Mint, YNAB, or Betterment is working hard to revolutionize fintech. Thanks for featuring these apps! Yessir! And it’s adding so much VALUE for people too – unlike most of wall street nonsense! Secondly – the Trim app always seems like a good idea, I know you tried Paribus before, have you tried this one? Thanks for sharing. Those apps look like great tools. I recently used stockpile to buy a Vanguard ETF as a gift for a friend who just had a new baby. It is cool that you can now buy shares of stock or an ETF as a gift card. Nice! So much better than another toy to collect dust! Thanks for sharing another resourceful blog, J. I am a big fan of yours. Wanted to know check if you know which of these apps work in Canada? Glad you’re enjoying, man! The only one I know for sure works in Canada is Wealthsimple – where, in fact, they started from and exploded before even coming to the US scene. You might be able to participate in others up there depending on whether you need a US address or not, but you’d have to check out the sites directly to confirm. I do wish more tech would bubble up in Canada, but unfort I don’t hear of much :( The tide is starting to change though! Really interested in Chime. I feel like before long brick and mortar banks will be obsolete. Chime seems to be on the cutting edge of the online banking movement. I dig it! I have the same feeling… will probably take a while as not everyone loves/lives online, but eventually the brick and mortars will be forced to pay attention and adapt or they’re gonna be in trouble! Stockpile seems very interesting, especially since the cost of individual stocks for some great companies is so large. I think I need to do some research now, thanks! Trim looks very useful. I am definitely going to give this a try!